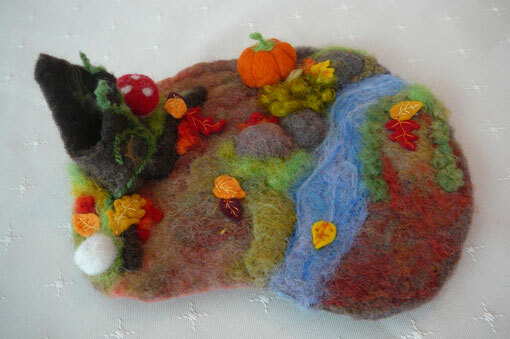 These pieces are felted scenes made to be used as playscapes. Each piece has been created with reverence and awe . Each one is a learning adventure intended to encourage creative play, stimulate imagination and especially to create an awareness of the interconnection of all things. As playscapes they call for the child to interact; to add to and to subtract; to place found items from nature, perhaps some other figures or their own handmade craft items. I would hope that it encourages participants to sing and dream, to make, to create, and above all to thoroughly enjoy the experience . In other words to encourage thinking, feeling and learning. Not only are they are a great tool for stimulating imagination these scenes also serve to encourage storytelling and language skills. Pieces like this can also be used as teaching aids for social studies, nature study, and geography where sometimes a visual and tactile object can have profound impact and help develop greater awareness. As an art piece these small scenes have validity but as an educational tool even greater versatility. Rudolf Steiner himself expressed the notion that Beauty should be a staple element in education and I feel that through beauty can be gained deep insights and an appreciation for all things. We open our eyes and hearts to the wonder and magnificence that Mother Nature wishes to share with us . Through beauty in our lives, our souls and spirits are enhanced and our everyday lives enriched. Perhaps in learning to appreciate the beauty around us we may also learn to find and honour the beauty within. I love your work! Can I place a link from my Facebook page to your blog? weeeeeeeeeeeeeeeeeeee….these are gorgeous Lovely Lady! Well done! Ellia looooves her little gnome lady, she has found a very secret special place for her. It annoys me a bit because we can’t see her !!! lol. Sorry Ellia and I missed you today. I hope you didn’t work under stress for the little maybe blue gnome girl we talked about. 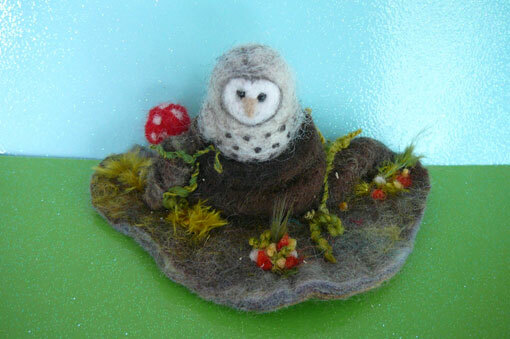 We will come back next/last Monday to craft and will be delighted to meet our new member in the dry felted family. Lilou will loove her I am sure at least as much as I do! Your art amazes me completely. 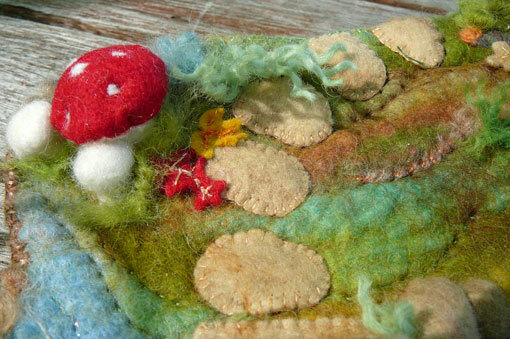 Your hands must have some magic in them to transform beautiful wool in such incredible precious objects. There must be much love and patience in you to bless us with such dexterity. thank you for the piece of dream you share with us all. 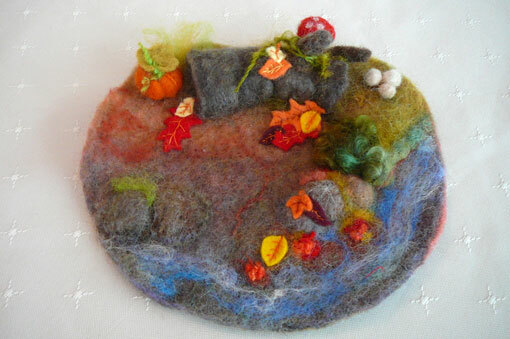 I’m wondering if you sell your amazing felted nature playscapes? They are beautiful! These make me think of the story in C.S. Lewis’s autobiography about how his first glimpse of that mystical connection he calls “joy” took place when he was contemplating a little miniature landscape built of leaves and whatnot that his brother had made. 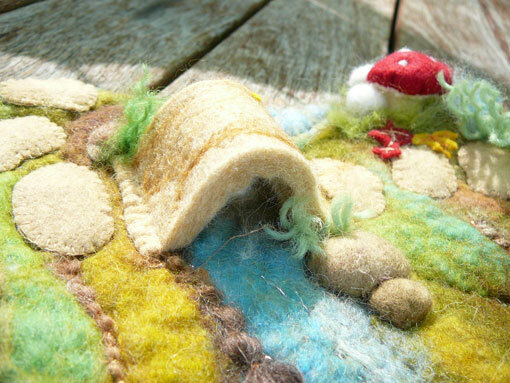 Your felt-scapes have the same numinous feel. Do you sell these works of art? I am amazed and inspired. I was wondering if you have a price list for your pieces. I would love to talk to you about buying some. Thankyou for the comment and your enquiry,I have emailed you. Thankyou Amber, main tip to share is that to go to Source, Nature,who provides so much inspiration.Hope you enjoy the adventure and the creating. I discovered your website on Pinterest, and I love your creations. You inspired me to try some of my own. 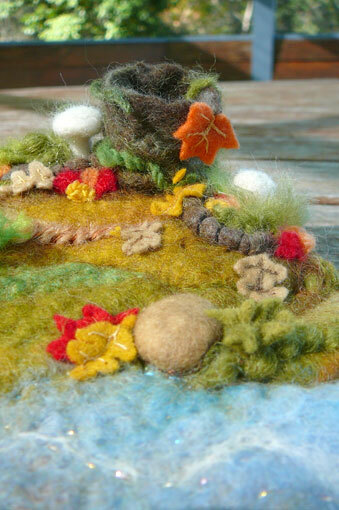 In the last day and a bit I’ve made the spring sprout, and 3 heartfelt tiny figures for my Mom and 3 friends. My brain is spinning with all the things I want to try. Thank you for opening up a whole new world. This has made my day. Happy creating . Build your garden, grow your compassion, and share your bounty with all of the people that you love. using man made chemicals and insect repellents, a process often known as companion planting. This often turns into a burden or liability in terms of maintenance and aesthetics. Those are beautiful. I love the owl. I know some Waldorf children that would love these! Thank you,and thank you for visiting the blog. I popped by yours and delighted to find a kindred spirit too. Hi!I love all your work. So beautiful and magical! How do I contact you to find out pricing? 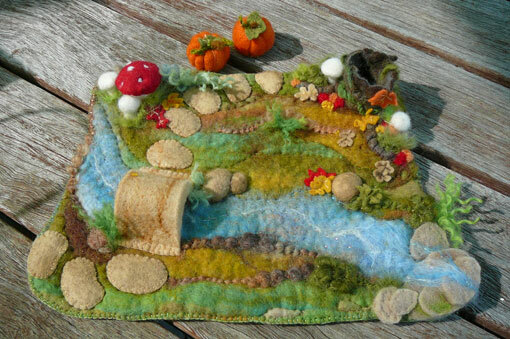 Are you still making play mats? Hi Julie,,thankyou for contacting,have had computer issues,as yet to replace,you can email me ,find me through pinterest or facebook. Thrilled you like.still stiching.